the 2006 International Indoor Championships in Las Vegas! 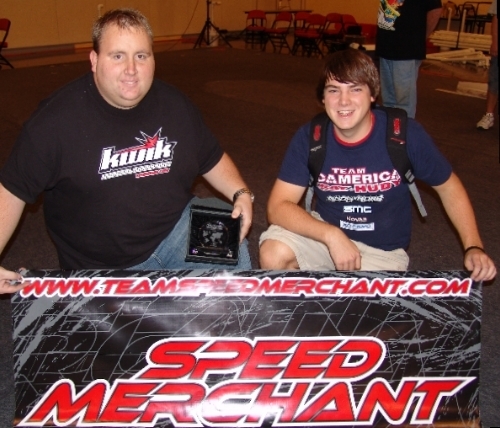 After a very impressive 6th place outing at the 2006 On-Road World Championships in Turin, Italy a few months back, Mike Dumas proved once again that he's one of the best in the world with a TQ and Win at the 2006 International On-Road Championships in Las Vegas, Nevada! This was the 2nd annual IIC (International Indoor Champs), and was even bigger and better than last years event. Scotty Ernst, his brother Boomer, and their crew continue to take professional RC car racing to new heights. Check out the IIC website by clicking HERE. This years event was held at the South Coast Hotel & Casino just a few minutes down from the end of the Vegas strip. The hotel was very large with great rooms and tons of nice facilities and amenities for all of the racers, and their families. You can visit the hotel's website by clicking HERE. The schedule was for practice on Wednesday and Thursday, followed by four rounds of qualifying on Friday and Saturday, and the Mains run on Sunday. Practice went well for the team, and we focused on getting the cars hooked up on the new carpet. Generally, practice is just a matter of our drivers getting the track lay out dialed in, and really working on finding the proper motor and gearing for the race track. After four rounds of practice, we were pretty comfortable that Mike had a top 5 car going into qualifying. Mike was able to post the single quickest individual lap in 12th scale Mod with a 10.232 second lap time. Friday Qualifying went well. At the end of the day Mike and his Rev 4.5 were seated 3rd overall in 12th scale Modified. Mike had bumped the fastest lap at the event down to a 10.209 second lap time. Overall, we were happy with the handling of the car, and our tire choice, but Mike was still working with his motor builders to get the proper "feel" or "power band" in his race motor. Saturday... two more qualifiers to get it right. The 1st qualifier of the day was going great. Mike had changed to a different Team Brood race motor, and was immediately looking good with it. He was well along to setting a new TQ for the event when he had what looked to be an electrical failure. His car experienced a very quick "dump" at the 7 minute mark....much too early to have actually used up all of the batteries power. After the race, we really couldn't diagnose the problem. The battery, motor, and speed control all seemed to be working well. The only thing we could think of is possibly a "false peak" for the battery. Needless to say, we made extra sure Mike's battery had a full charge going in to the last qualifier. The good thing that came out of our shortened 3rd qualifier was that Mike was really happy with his Team Brood motor selection. He said that the new motor had a much better "feel" for the track lay out, and was really looking forward to his next (and last) qualifier. Going into the 4th qualifier, we knew Mike had a solid shot at grabbing TQ for the event, but having all the stars line up for you is always tough to pull off. At the start of the heat Mike jumped up to the lead position and was announced to be on a new TQ pace. Through out the heat Mike stayed in the top 3, only loosing the lead when he was held up by passing slower traffic. Towards the last minute, Mike, Andy Moore, and Hubert Honigl were all on a new TQ pace. With just 4 laps to go, Mike moved into the pace setter spot and held it to the end of the heat, setting a new TQ for the 12th Scale Modified class, and garnering lots of cheers from the enthusiastic Vegas crowd. Sunday....12th Scale Modified A Main at the 2006 International Indoor Championships, Las Vegas, Nevada. Going into the main we were pretty confident that Mike had the car to beat, but racing "luck" as always would probably be a factor in the outcome of the race. Our biggest worry starting from the TQ position is always just making it thru the 1st corner with out getting tagged from behind. Although at this level the races are very clean, you still can't have 10 cars vying for the same piece of real estate with out a few bumps on the way. We spent a lot of time prepping Mike's JACO tires to get them extra sticky for the start of the race. At the horn, Mike immediately stretched his starting gap by a couple of more feet, and made it thru the 1st turn clean. Behind him 2nd qualifier Andy Moore caught the chicane and broke his car. This gave Mike a little breathing room. 3rd qualifier Hubert Honigl jumped up to second place, and gave chase to Mike. Mike set a quick pace, but a little slower than his TQ run so he would have plenty of saved battery to fend off any challenges to come. For the first 3 minutes Mike held the lead pretty comfortably with Hubert trying to real him in. Just past the 3 minute mark, Hubert caught a corner pretty hard, and knocked himself back to 3rd place. That moved Jon Orr and his LRP brushless powered 12L into second, about one quarter of a lap back. Mike seeing Hubert's bobble, slowed his pace up a little to conserve more battery in case Jon was able to close the gap by the end of the race. The last 3 minutes went very smooth. Mike was out front on cruise control still saving battery. Lapped traffic was very friendly, and while Jon was closing the gap, it was readily apparent that he didn't have enough speed to catch Mike before the end of the race. That's how they finished. Mike and his Rev 4.5 led every lap of the A-Main, and LAPPED every position up to Jon Orr in 2nd place!!! Just an awesome win for Mike, the SpeedMerchant team, and all of Mike's sponsors. We would like to thank all of Mike's sponsors. With out them, our Rev 4.5's would just sit there and look cool. and all of his associate sponsors. High resolution pictures and Mike's complete set-up is posted HERE. In Stock class Jeff Brown and Peter Robinson both had very sucessful weekends. Jeff followed up his TQ & Win at this year's Paved On-Road Nationals with a 4th place A-Main finish at Vegas. Jeff's Rev 4.5 is powered by Team Kwik Batteries and Motors. Great run Jeff!!! Peter who just won the 2006 On-Road Carpet Nationals for us had a great weekend and finished 6th in the A-Main. Peter runs SMC batteries, Team Brood horsepower, Protoform Bodies, and JACO tires on his SpeedMerchant Rev 4.5. SpeedMerchant would like to give a special thanks to Peter for his hard work and preparation. Peter's going into a semi racing retirement for a few years to attend college. We wish him the very best and know that he'll do just as well in school as he does in racing. Thank you and good luck Pete. We'll miss you.